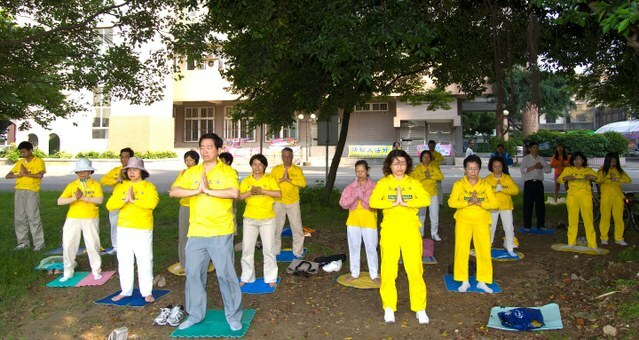 Practitioners in Neili, Taoyuan gathered around 3:00 pm on May 5th, 2012 in Culture Park to do the exercises together and tell people about Falun Gong. By doing so, they also celebrated the approaching World Falun Dafa Day, on May 13th. The park is a popular place for local people to take a rest. Before dusk, many people go there to take a walk or do some sports. Some people stopped in front of the photo display the practitioners had put up, and therefore saw the information about learning Falun Gong. Ms. Zhong handed out flyers to passersby. She said that when a mother and son passed by, the mother took the flyer, read the contents attentively and then asked Ms. Zhong about the nearby practice site. She also said she would take a good look at the contents of the photo display. A young man took the flyer and said that he had heard about the Chinese Communist Party's suppression of Falun Gong. Ms. Zhong explained to him the reason for the suppression. Ms. Zhong told the young man, “Practitioners are clarifying the truth not because they want everyone to practise Falun Gong, but because they want to remove any misunderstandings about the practice. Falun Gong is a good practice.” The young man nodded to express his agreement and understanding. In addition, a boy asked for truth clarification materials, and said that he would take them home for his family. Nearby business owners received the materials and thanked Ms. Zhong. Through practitioners telling their personal experiences, more and more people have learned about the goodness of Falun Gong and the brutality of the persecution. Therefore, practitioners hope to have more opportunities to spread Falun Gong outdoors. Ms. Zhong is 73 years old, and began practising Falun Gong in 1998. She said that the biggest change in her after beginning her practice was her xinxing improvement [Editors note: Moral Quality]. Her family life also became more harmonious. She said that when she disagreed with her family before, she would always insist on her own ideas. Now guided by Master Li Hongzhi's Fa principles, she requires herself to approach things from the perspective of others, and thus many conflicts don't intensify. Fifty-year-old Mr. Gao began practicing Falun Gong in 2000. He said the biggest change for him is that he can think of others and be considerate of others. This benefits him a lot in work and family. Mr. Gao added that practising Falun Gong enables one to be more healthy both physically and mentally. He looks energetic and his skin glows, which is the best testimony of physical and mental harmony from practising Falun Gong.